Here we see the orchid fruit en face. Left of the guardian ant’s abdomen is the pit of the column apex where the pollinia used to be. All sepals and petals including the lip are still present, but will be discarded. It is a privilege to be able to grow native wild orchids in their natural climate outdoors. Although the flowers are spectacular also in a greenhouse on another continent, such an orchid is disconnected from its natural habitat. An interesting observation in Vanda liouvillei (Orchidaceae) is that the buds seem protected by ants, just like in Duabanga, peony and many other plant species. 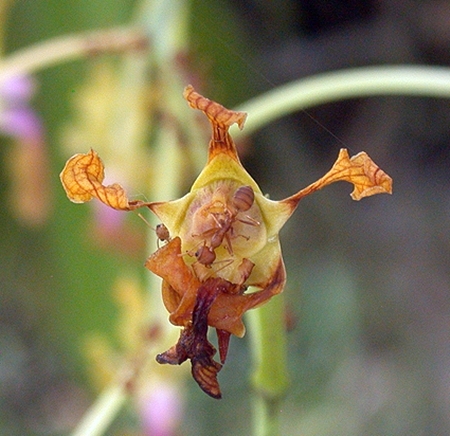 The orchid buds must exudate compounds of interest to the ants. If it was plain sugar ants would crawl on all nectar-rich flowers, but they don’t, so the attractant might be quite complex. Then, when the flowers open, the attraction disappears because the ants are sporadic or absent. The absence of ants during its flowering stage makes sense, because an open flower must invite its pollinating insect, not have it killed by ferocious ants. After pollination and successful fruit formation (I am still unaware of the pollinating insect) the ants are needed again. The ants are attracted to the vulnerable young fruit, which must be protected from hungry insects, mammals and gastropods. When the fruit is dry and mature, the minute dust-like seeds disperse by the wind. Recently I rubbed an entire ripe fruit of a Vanda denisoniana orchid to the rough bark of a Pterocarpus macrocarpus tree. It will be interesting to see if that results in any future seedlings.